Goodbye Ericsson. Can the Japanese powerhouse go it alone? Update: We've taken a better look at the NFC capabilities of the Xperia S and played with the SmartWatch in a bit more depth - check out our findings. So Sony has paid Ericsson off with a nice little divorce settlement and is now single and ready to rock - and the result is the 12MP-camera, HD screen-toting Sony Xperia S.
Obviously, it's a line carried over from the Sony Ericsson era which saw the maker release an Xperia handset on what felt like a weekly basis. But we get the feeling that this is something a little more special. Specs wise, it's pretty high end so should give us a great experience if we're judging it on paper. 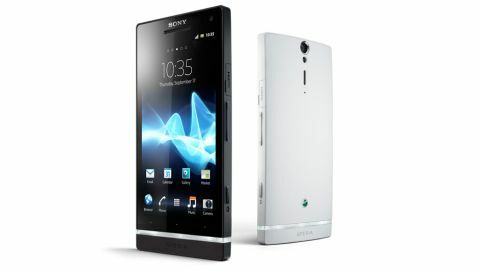 A fantastic 4.3" screen with Sony's Bravia HD technology, 12MP Exmor R camera, DLNA, Android Gingerbread 2.3 and so forth. And it looks pretty hot too. A slab made out of glossy piano black glass with a transparent strip across the front that also acts as an antenna, this could quite easily be a swish remote for some posh Sony toy rather than a phone. It's pretty substantial in the hand at 128 x 64 x 10.6mm, creating an impression similar to the Samsung Galaxy S2, albeit a little heavier at 144g. And also a fair bit fatter with a curved back that makes the phone feel a lot fatter than we'd have liked. Up top, you'll find a power/unlock button and the 3.5mm headphone jack whilst the right hand side gives you volume buttons, a HDMI out socket (the cable came in our box) and a dedicated camera button. The bottom has little of interest whilst the right side guards the charging/sync port. It's behind a fiddly cap that you have to pop off which irritated us very quickly and we can't see it being too long before that ends up snapped off. It's not that it's hard to open – but you need the physical prowess of a ninja to get it back on again. The rear holds the camera lens and LED light and interestingly, although the front of the Xperia S shows off the world famous Sony logo, the rear holds the old Sony Ericsson logo which bizarrely, Sony has elected to keep. It's made of plastic and this is one of the downsides of the Xperia S because the top heavy weight – and the fact that the keyboard is at the bottom of the screen – means it doesn't balance well in the hand. Several times we came close to dropping it and we can see a lot of these landing on the floor. The front of the phone is one large dark panel with a small indentation for the earpiece and the front facing 1.3MP camera. That antenna strip at the bottom which looks like three light up buttons is actually just a piece of pretty glass with the user forced to press just above them on the actual body of the screen to get any sense out of them. They're not particularly responsive and we found ourselves quickly tiring of their prettiness and grumpy at their rubbish responsiveness. Still, having said that, this does feel like a very premium device and one you'll pay through the nose for. Whilst Sony and the networks won't be able to command Apple like prices, you'll still expect to part with a good chunk of your savings to get one. Although not on general release yet, pre-order sim free prices are estimated at around the £450 mark which pits the Xperia directly against premium Androids like the Samsung Galaxy S2 and LG Prada 3. Expect to pay at least £30 a month on a 24 month deal if you want this new pretender gratis. Black is the order of the day but there will also be a white variant. Unfortunately, that's exclusive to Phones4U so will be harder to get.